FINANCIAL DISTRICT — Twenty-one restaurant workers lost their jobs last week because of the disruptions caused by the Occupy Wall Street protests, the cafe owner said Tuesday. "Now, Wall Street is deserted," Epstein said. "The only people who walk down Wall Street are people who have to walk down Wall Street. It's transformed from a beautiful pedestrian mall to a police siege." Epstein just opened the 23,000-square-foot Milk Street Cafe in June, marking the first expansion of the eatery and catering business with the same name that he and his wife opened in Boston 30 years ago. Using loans and private investors, Epstein poured $4 million into the project and said he was proud to be part of lower Manhattan's revitalization. On the restaurant's first day in June, former Deputy Mayor Stephen Goldsmith helped ring an "opening bell" and praised Epstein for creating much-needed new jobs in the city. The restaurant's sales grew steadily over the summer, and Epstein said he was on track to break even by October or November at the latest. But now, Epstein said he isn't sure how much longer he'll be able to keep his doors open. In addition to laying off 21 of his 97 workers last week, he also cut back the restaurant's operating hours and now closes at 3:30 p.m. Monday through Thursday, rather than 9 p.m.
"If we don't get these barricades down, we will be out of business," Epstein said Monday. "I give myself three weeks." Epstein said he is frustrated that he cannot get anyone at the city to return his calls, and he said he would never open another business in New York if this one fails. On Monday, Epstein did manage to speak on the phone to Donald Trump, his landlord, and Trump said he would try to intervene with the city to get the barricades removed, Epstein said. Marc LaVorgna, spokesman for the Mayor's Office, said the city wants to help Epstein. "We have been working closely with the community to address the issues caused by the Occupy Wall Street protesters and will continue to do so," LaVorgna said in an e-mail. Mayor Michael Bloomberg criticized the Occupy Wall Street protesters in October for negatively impacting local businesses and said they are "trying to destroy jobs." 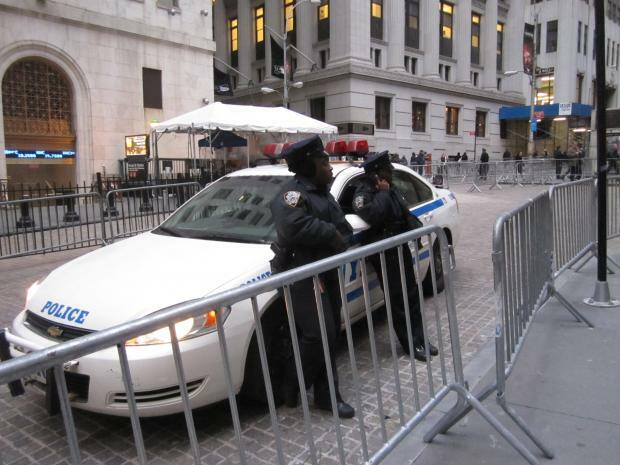 Occupy Wall Street released a statement Tuesday saying that the blame for the barricades rests with the NYPD, not the protesters. "The NYPD makes the decisions on the part of police barricades," the statement said in part. "This is not our choice and we would never want businesses to have to deal with inconveniences that may reduce their business traffic." The NYPD and Trump's spokeswoman did not immediately respond to requests for comment Tuesday. The issue of the Wall Street barricades has come up at recent community meetings, and NYPD officers have repeatedly said that the security barriers must remain in place because the protesters do not give advance notice of their marches and routes. Epstein said he supports people's right to protest, and is proud to have participated in a massive 1987 march on Washington to free oppressed Jews from the Soviet Union. But he said he couldn't condone Occupy Wall Street's tactics. "This movement is not serious," Epstein said. "If it was, they would not want small businesses going out of business."